An abuse victim in Bradford has called for an independent public inquiry into sexual exploitation in the city. 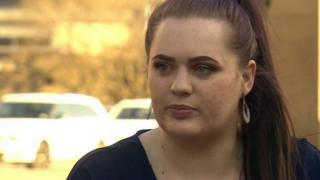 Fiona Goddard, 25, said most of the girls in the care home where she lived were sexually exploited. Ms Goddard gave evidence at a trial last month that led to nine men who abused her as a child being jailed. Gladys Rhodes White, the council's interim head of children's services said she had no evidence exploitation was "a wide-scale, large issue". Ms Goddard, who has waived her legal right to life-long anonymity, said "a lot of girls" who were abused had not come forward. "I... met numerous girls while we were out with other guys that maybe didn't come from care homes, but came from broken backgrounds and they were all getting exploited. "There definitely needs to be a public inquiry, it needs to be an independent one." She said any inquiry must look at issues in all of the UK's major cities. The allegations against the convicted men came to light in 2014 when Ms Goddard contacted the BBC after she saw a report on the grooming and sexual abuse of hundreds of young girls in Rotherham. The trial at Bradford Crown Court heard the men used used alcohol and drugs and threats of violence against the girls "in order to facilitate their sexual exploitation". Ms Rhodes White said Bradford Council had made "massive progress" in tackling abuse. "When children come into our care we want to keep them safe, we want to protect them, and if people haven't done that for those young girls then they have been let down and that's not acceptable," she said. Addressing Ms Goddard's call for a public inquiry she said: "I'm not seeing evidence that there is a wide-scale, large issue specific to Bradford. "I think if it did come to light that there were lots of victims that had been missed that would be something the Safeguarding Board would want to look at." In a statement West Yorkshire Police said: "Tackling child sexual exploitation remains a priority and we continue to work with partner agencies to safeguard victims and take action against perpetrators. "Victims are urged to come forward and speak with us or our safeguarding partners."